When it has countless possessions of course any thing becomes possible to do. But it could be just a few people who think to have a collection of thousands of cars. But not for Sultan Brunei Hassanal Bolkiah. Reported Marca and dupontregistry launch from Forbes, Sultan of Brunei Hassanal Bolkiah who is also as an uncle of Faiq Bolkiah, Leincester City player who is one of the richest man in the world. At the age of 71 years, his property is worth more than $ 20 billion or if dirupiahkan about Rp 265 trillion more. Not until there, he was listed as the largest and largest collector cars in history. Two years ago that is 2015, recorded more than 5,000 exotic cars, sports, rare, and limited production cars are in the home. In detail, there are at least 300 Ferraris, 20 Koenigsegg, 6 Dauer Porsche 962 Le Mans, 11 McLaren F1 cars, 600 Rolls-Royce, and hundreds of Mercedes-Benz. Everything is estimated to be worth Rp 4 trillion, only slightly when compared to the amount of wealth. 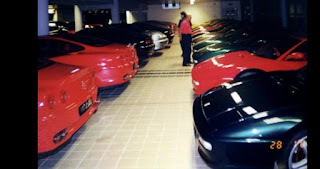 Not much different, his sister, who is the father of Faiq, Jefri Bolkiah also collect 2300 units of vehicles in his home. There are Rolls-Royce, Bentley, Ferrari, to Mercedes-Benz. Not only that, he also has a private plane Boeing 747. While Faiq himself, it is not known whether to follow the footsteps of his father and his uncle who loves four wheels. But reportedly some time ago he had spent funds amounting to 35 million pounds sterling (Rp 638.7 billion) within a month to buy a car, pen watch made of white gold, and anything else. Here's a list of cars based on the chassis number parked in the garage of the house of Sultan Brunei Hassanal Bolkiah. 0 Response to "Most Car Collectors Throughout History Got 5,000 Cars"